When we think about first responders saving lives, the first thing that comes to mind is response – performing a search and rescue, dealing with a medical emergency, fighting a fire. One factor that many people don’t consider is first responder scheduling, or making sure the correct people with the necessary qualifications are on duty and ready to respond. First responder scheduling can have an enormous impact on how incidents are managed and prevent loss of life. Check out the following infographic to get a big picture view of how having the right people scheduled to work can save lives in a few key ways, both for constituents and first responders themselves. Many first responders suffer from heart attacks and other injuries due to stress and overexertion. Scheduling software shows when staff members have worked too many days in a row per union or department rules. Departments can use the software to make sure that responders take breaks between shifts and overtime is allocated fairly. When the appropriate staff are scheduled to work, dispatched apparatus can respond to incidents right away. No scrambling to fill last minute breaches. Response times are low and constituents can quickly get help. Scheduling software tracks the expiration dates of current licenses and certifications. This way, crews always have the personnel with the exact skill sets they need at the incident, such as EMR certification. Don’t let vacancies lead to loss of life down the line. Scheduling software flags any breaches in upcoming shifts with daily, weekly, and monthly views, so administrators can quickly fix shortages and avoid under-staffing. Well-staffed departments are better able to respond to incidents quickly, help their communities, and save lives. Download the infographic PDF: How First Responder Scheduling Software Saves Lives. So the next time your friend, colleague or family member who works as a first responder is scheduled to work, take the time to think about the lives they might be saving in more ways than one. One of the downsides of first responder scheduling is that it can take a lot of time and resources to make sure the appropriate people are scheduled to work. 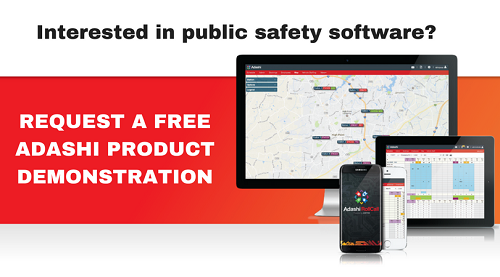 That’s why many public safety departments are turning to first responder scheduling software to make scheduling firefighters, police, and EMS easy and efficient. For more benefits of scheduling software, check out our recent blog post. To learn about Adashi’s scheduling software RollCall, check out our product page.